Metal core PCB + silver plating process Silver plating on the reflectance reaches about 95% (@ 550nm), is an excellent reflective metal material, aluminum / copper surface treatment of the metal substrate + silver plating is used as an early light manufacturers use most of the COB MPCB, COB package substrate technology, generally suitable for use in small and medium power less than 10W COB LED light source. Because silver is very demanding on the environment encountered S or Cl prone black metallic silver sulfide problems, leading to a serious decline COB light source module after the package, often a lot of COB light source manufacturers will face similar problems; same time, using MCPCB substrate material, the thermal conductivity of the sheet in the thermal insulation layer 1.0-3.0W / m? k, the thermal resistance due to the problem is not suitable for high power applications COB light source. 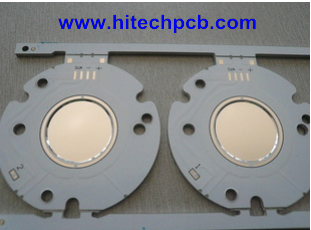 With the ceramic base, high reflectivity mirror aluminum materials technology matures, more and more MPCB manufacturers will abandon the process MCPCB + silver plated and selected other COB substrate alternatives.